Paper Crafts 4 — Few can rival or exceed your might in your Estate’s arts. (Superior) Holiness 3 — You’re immune to most toxins, and you’re overflowing with sacred spiritual power. If you apply that power directly you may perform wonders: plants bloom, sickness dissipates, and poisons and impurities fade away before your outstretched hand. Randomness distills down to meaning, with coins likely to land on edge or repeat themselves and books likely to fall open on relevant pages. Evil weakens. The world revitalizes and calms. Everyday Life 1 — You still enjoy mortal desires. Solitary 0 — You like being alone. During his mortal life, Kami was a Japanese man of tall stature and a slender frame. He had short, straight black hair and very piercing black eyes, which complemented his face’s sharp features. At a glance one might have guessed that he had a frail constitution. Now as a Power, Kami looks more stylized. His once-unremarkable hair is now longer and slightly spiky, like you could cut yourself on it. His eyes are even more piercing, like a hawk’s. His Estate’s nature flows through him, so every now and again his physical shape is frail enough that you could literally punch a hole through him. His hands look very skillful and experienced. He has an air of purity about him. He likes to wear Shinto priest robes and other formalwear, although nowadays almost all his clothes are entirely made out of his Estate’s nature. Kami was born some years after the end of World War II, from an American mother and a Japanese father. It was an unlikely match, an arranged marriage set up to build good relations between their respective families. He didn’t know most of the details growing up, nor did he wish to know why, but his parents hated each other. They might have held some distant respect for one another in their pride, and kept up appearances around him, but they mostly just fought when they were alone. His mother, from which he had inherited his fragile constitution, died when he was 10. From her he inherited his love for paper crafts, though it would not be until later that he realized how deep it was. He mourned for her, and held onto his memories of her for long, but with time he forgot his pain. His father had a position of some importance as a member of a shrine family, so when he reached the proper age for it he began training to follow his steps. As he reached 20 years of age he became a proper priest, and dedicated himself to discipline. He immersed himself in his work to isolate himself from others. Well, for the Light of humanity to shine through, he would tell you if you asked. The experience formed his core, shaped his being forever. He awoke to the holiness that was inside him all along, hiding itself. 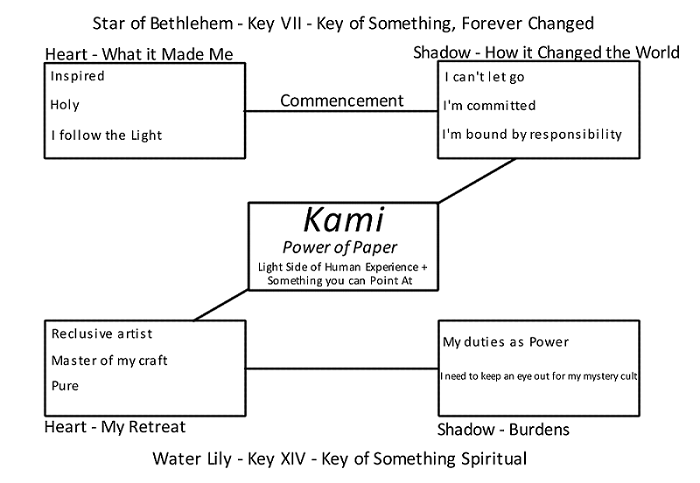 Ever since, Kami (カミ, God/Paper), as he took to renaming himself, has fully dedicated his life to his duties as Power. He has prospered, and had the good fortune to fill into the world of the Nobilis with not much difficulty. Exerting great influence over his Estate, he influenced its growth around the world, making it even more commonplace than it was before. He also created the Mystery Cult of the Whispering Papers, as a tool to encourage its development in a less direct fashion. He has found purpose in his life, but recently he has come to feel unsatisfied - shouldn’t he be able to do more? Is he doing right, in the first place, to expand his influence in the way he has for the past few decades? What does the future hold in store for Paper as a whole? These questions and more have slowly grown in his mind for the past few years. It would be relatively simple for someone with his level of control over his Estate to change all Paper to make it ecologically friendly, or give it the utility it needs to stay relevant in these times of growing electronics… but he feels that it's pointless without some proper philosophical grounding. It'd be too easy a solution. Thus, he wishes to find a way to reconcile his ideals with the difficulties of reality, before trying such a method. After much looking for an answer, he stumbled upon some old records from a previous Sovereign of his Estate, naming a 'Grail of Endless Paper', an artifact of unspeakable power, heavy with the weight of divinity. Supposedly produced from a fallen branch of Yggdrassil, with the aid of the Jotuns and other manner of creatures, the records stated that it was lost long, long ago, never to be found. This, Kami decided, was just the thing he might need, something to justify him and give him an objective.